As the Washington Capitals transformed into a regular-season powerhouse and Stanley Cup contender several seasons ago, Verizon Center naturally paralled that evolution. Once a haven for opposing fans, the arena overflowed with red-clad, cacophonous supporters, providing the Capitals with one of the NHL'a most pronounced home-ice advantages. Only the San Jose Sharks could boast the same success between the 2008-09 and 2011-12 seasons, matching the Capitals' 110 wins in 164 home games. Lately though, the Capitals had given their fans very little to cheer about. Five wins in 14 games prior to Washington's game against the Tampa Bay Lightning on Saturday, the team's worst start at Verizon Center in seven years, produced little excitement. The silence of indifference was often met by frustrated sighs of resignation, sounds that had become more distinctive than the wail of the Capitals' goal horn. Yet there was a throwback feel Saturday. 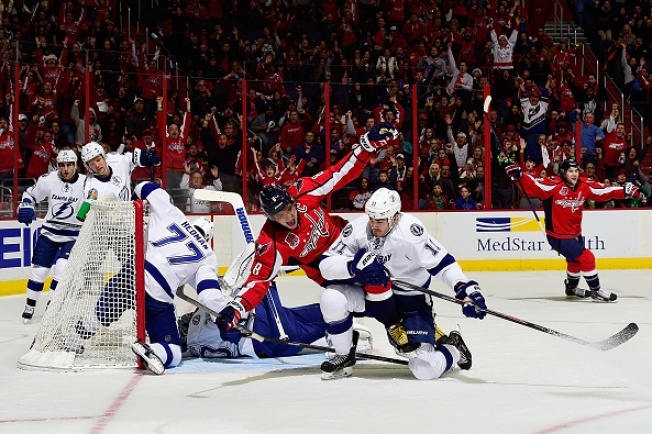 The Capitals, in a scoreless tie with the Lightning midway through the second period, were forced to kill a two-minute two-man disadvantage. Lightning forward Ryan Callahan, hugging the left post, poked at a rebound that skittered toward the goal line, inches away from siphoning the energy out of the building. Braden Holtby contorted himself, scooping the puck with his stick blade and quickly freezing it. For the first time this season, Verizon Center truly erupted. "Holt-by" chants were followed by thunderous roars with each successful clear. Alex Ovechkin and Mike Green charged out of the penalty box. The Horn Guy trumpeted his trademark cadence, the deafening "Let's Go Caps!" call-and-response functioning as fuel at ice level. "People sometimes [don’t] realize how much energy they can give us, but we’ve got to give them something to get excited [about]," coach Barry Trotz said. "If it’s a great hockey game and we need a boost, we’ll take any energy they can give us. With momentum firmly seized, Nicklas Backstrom flung a backhand past Lightning goaltender Ben Bishop less than two minutes later, the first of his three goals in a 4-2 victory. Of course, it wouldn't have been a Capitals game without cardiac-arrest-inducing anxiety; Tyler Johnson and Matt Carle scored twice in the final five minutes to give Tampa Bay an unexpected opportunity to tie the game. Eric Fehr relieved the mounting tension with an empty-netter from just inside the red line with 39 seconds left. The crowd exhaled and cheered once more, a vintage night complete. "The energy was great," defenseman Nate Schmidt said. "When you have that kind of energy in a game, it makes a big difference. It gets everybody into it. The fans into it, us into it."